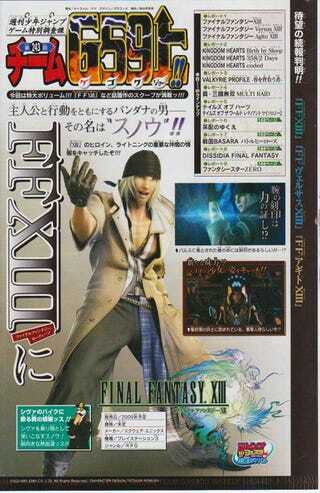 Time for more blurry Final Fantasy XIII scans and pics. These are images that appeared in Square Enix's dazzling Tokyo Game Show 2008 trailer. The last issue of Weekly Shonen Jump tells us that the bandana-wearing blonde dude is named "Snow." Really wish there higher quality images. The TGS trailer looked great.